As you can see, this is a non-related hair post...sorry ya'll! I just wanted to RAVE about this product. I used this consistently in the past and I'm not sure why I stopped. Whenever I would get a pimple, I would dab some of this on it and leave it on overnight. The next morning, I would wash it off and the pimple would either be gone, dry out or shrink to a much smaller size. I would also use this as a full mask once a week and a cleanser. Last/this week, I was experiencing some small break-outs and I was thinking of ways to get rid of them. Now, I typically use Aveeno Positively Radiant facial cleanser and moisturizer, but I started to realize my skin looks REAL oily towards the middle of the day. I remembered that my skin reacted better to Neutrogena Products, so I went to target and browsed that section and saw my Beloved Neutrogena Clear Pore Cleanser. I purchased it right away! Last night, I put some on each of my pimples and washed it off in the AM with the Aveeno. Low and behold, the pimples have shrunken and I'm pretty sure they will be gone by tomorrow! So, this is something I will never..ever switch out of my skin care regimen again! I noticed that my skin reacts better to Benzoyl Peroxide and it HATES Salycilic Acid. I'm trying to figure out if I should use this as my only cleanser and ditch the Aveeno. I'll figure that out soon enough. - As a Daily Cleanser to kill the bacteria that can cause blackheads and breakouts. Gently massage the rich creamy lather over skin and rinse with water. - As an Intensive Mask for deep cleansing and extra oil control. Smooth an even layer ober skin, allowing the formula to penetrate for up to 5 minutes before rinsing with water. You'll feel it's cooling intensity build as it penetrates into the pores. I also tried Aveeno but was not satisfied with it. Thanks for your review about Neutrogena. 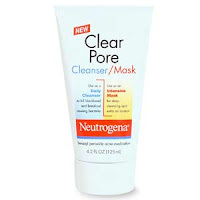 Next time when i would buy clear pores cleanser i would keep neturogena in mind.